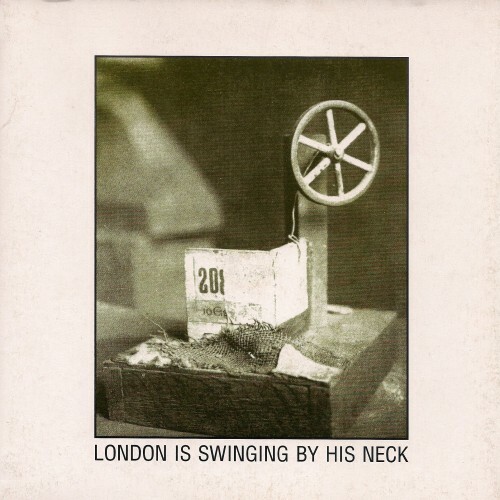 KirkLake and Roy Montgomery collaborate on this seven-inch single, 'London Is Swinging By His Neck'. KirkLake is a writer and musician. His acclaimed debut novel, 'Never Hit The Ground' (Pulp) was published in 1997 His recordings include the recent single 'A Beautiful Ending' (4M) and the collaboration with London romantics Jack, 'Five Finger Discount' (I/) was one of the NME writers' Top 50 singles of last year. He has also released two internationally praised albums on Che that have been described as 'cinema for the ears' and 'hoodlum beat poetry'. His writing regularly appears in numerous publications in the UK and USA. He lives in London. Roy Montgomery has lent his inimitable guitar playing and deep, resonating voice to a number of New Zealand post-punk bands (notably the Pin Group and Dadamah). He has released many solo recordings on numerous US labels and has collaborated with the likes of Flying Saucer Attack and Bardo Pond. Last Year, Montgomery's and Chris Heaphy's Dissolve project released an LP of incidental soundscape music on the influential Kranky label. His most recent album is 'And Now The Rain Sounds Like Life Is Falling Down Through It' (Drunken Fish). He lives in New Zealand.